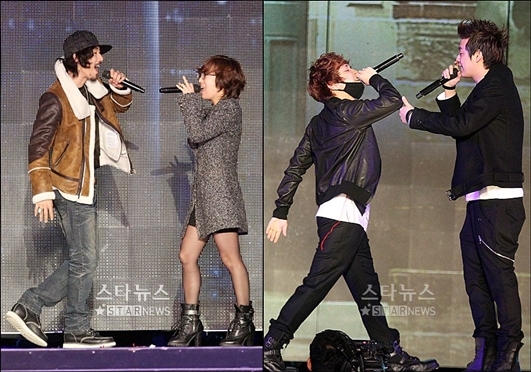 SBS cut Tiger JK and Supreme Team‘s performance during the SBS 2010 Gayo Daejun and Tasha, one of Korea’s top female rappers and Tiger JK’s wife, tweeted her displeasure. Unbelievable..!! It wasn’t even an encore performance..!!! What the heck?!?!? Why did they cut it short…?!?! SBS’s 2010 Gayo Daejun was aired on the 29th from the KINTEX in Gyeonggi-do. SBS is claiming that the segment went over its time allotted which forced them to cut it. Come on, I know it was a live broadcast and that makes things harder to adjust to, but they were just getting started. Like Tasha said, it’s not like it was an encore, it was part of their planned performance, they should have adjusted. You may have already seen it, but a few of us writers got up early and watched the show it was very obvious that they just cut TigerJK and Supreme Team off during their special stage. There were a few other performances that were cut off, which is also bad, but the rest of those were more just the end of the performances. I will say though, that although the transitions were abrupt, I did appreciate that the SBS PDs didn’t mess around and just kept pumping out the performances. But, and this is a big one, efficiency should never take precedence over letting an awesome performance air. In response to a tweet of Tiger JK’s where he mentions the disrespect, Simon D of the Supreme Team said this. Jung-kwon brother, you did a fantastic job it’s unfortunate that it was cut at the end, but it was still good, rest brother. Khip-hop definitely doesn’t get much respect. I tried looking for a clip of the performance to share with you all, but I couldn’t find one. Even in places where they had all of the other performances, that’s pretty sad (If I find one I’ll add it to this for y’all). Tiger JK and Supreme Team are awesome and definitely deserve more respect than this.